My thanks to Houston Granite and Flooring for your professionalism and wonderful service, and of course price!! Please thank the entire Houston Granite and Flooring team for the wonderful job they did on the install of our kitchen and fireplace, it looks amazing!! 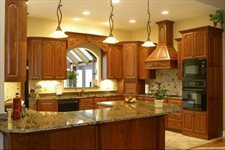 I will gladly recommend your company to anyone looking for granite!